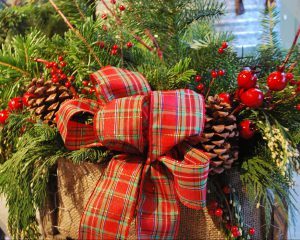 Create your own beautiful evergreen wall basket for your front porch using fresh greens, cones, twigs, ribbon and more. We have all the ingredients you’ll need, including an array of outdoor wall baskets for you to choose from. Examples and demonstration will be given to get you started and we’ll be on hand to assist in the creation of your final project. This is a great activity for groups! This is an open house style workshop…feel free to come any time during the event and be ready to get creative! 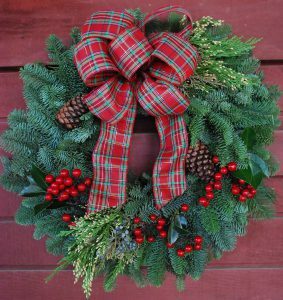 Simply purchase a plain evergreen wreath from our selection of fresh wreaths and decorate it to suit your personal style, using our large assortment of ribbons and decor. We will also provide fresh greens, cones and the proper tools to make the process fun and easy. This is a great activity for groups! Sign up to receive seasonal updates via your inbox!